The University of Baguio (UB) was founded by educators Dr. Fernando “Tatay” Bautista and his wife Mrs. Rosa “Nanay” Bautista. Tatay and Nanay put up the institution with the goal of helping rebuild the nation from the rubbles of the Second World War. The Baguio Technical and Commercial Institute, as it was then called, offered vocational courses. Since then, Baguio Tech has steadily expanded its academic portfolio, offering tertiary education in 1950. 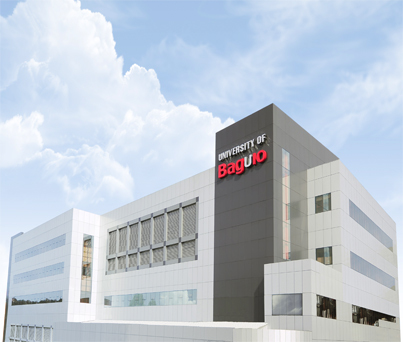 In 1969, Baguio Tech received the university status and became University of Baguio. In the years that followed, UB has steadily expanded its academic portfolio, alongside increasing access to education and providing more opportunities for students. Today, UB consists of the UB Laboratory Elementary School, UB High School, UB Science High School, UB Senior High School, 11 schools in the tertiary level, and the Graduate School. As of 2017, UB offers over 50 degree and non-degree programs. UB was granted autonomous status for a period of three years by the Commission on Higher Education as per CHED Memorandum Order No. 20, Series of 2016. UB is the only non-sectarian university in the Cordillera Administrative Region to be recognized with such distinction. The University of Baguio welcomes students from all walks of life, races, and beliefs. Through its more than six decades of existence, UB has nurtured generations of students from Baguio City, the greater Cordillera region, the rest of the country, and at least 19 foreign nations.